I am trying to fully remove a kernel extension which I installed by mistake, and I can't figure out how to remove it from the Disabled Software list. It appears in System Profiler and also in System Preferences security pane. Prelink failed for com.apple.kext.AMDRadeonX6000HWLibs; omitting from prelinked kernel. (kernel) Can't load kext com.apple.kext.AMDRadeonX6000HWLibs - link failed. (kernel) Failed to load executable for kext com.apple.kext.AMDRadeonX6000HWLibs. (kernel) Kext com.apple.kext.AMDRadeonX6000HWLibs failed to load (0xdc008016). (kernel) Failed to load kext com.apple.kext.AMDRadeonX6000HWLibs (error 0xdc008016). Failed to load /System/Library/Extensions/AMDRadeonX6000HWServices.kext/Contents/PlugIns/AMDRadeonX6000HWLibs.kext - (libkern/kext) link error. I'm puzzled as to why rebuilding the kernel cache doesn't fix this. I'm running Mojave 10.14.3 on a MacPro6,1. I have SIP disabled and I'm using @goalque's patch to use an external Radeon Vega64 GPU. The latter half of my question turned out to be a red herring. I ran the same grep on another system which has never had this driver installed and it also appears in the prelinked kernel there. Anyway, the list of Disabled Software is stored in a SQLite database located at /private/var/db/SystemPolicyConfiguration/KextPolicy. This file is protected by SIP, so modifying it requires either disabling SIP or booting Recovery mode. In this case I deleted the entries with this command, and it takes effect immediately. Not the answer you're looking for? 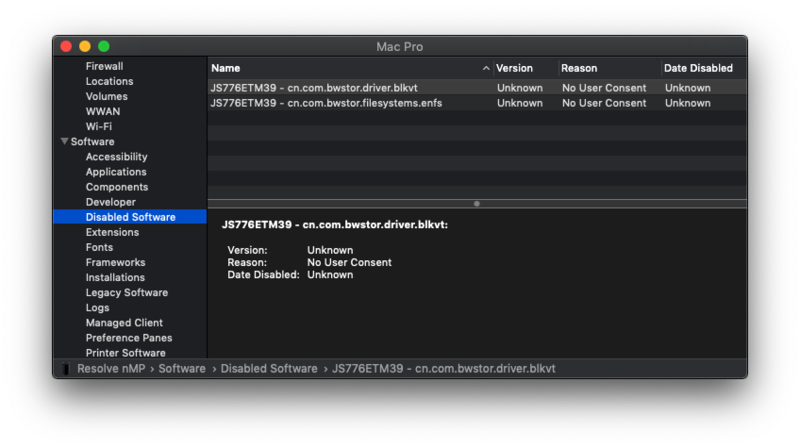 Browse other questions tagged macos mojave kernel kernel-extensions . Any idea why the pkg process in OS X Yosemite (10.10.2) would replace the Markup.appex plug-in Preview?